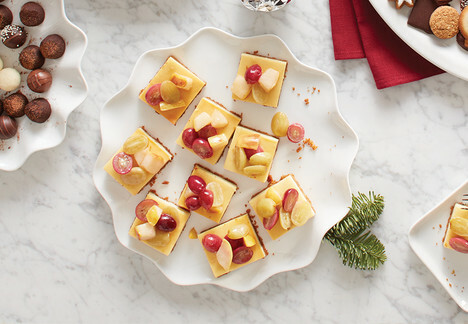 Traditional cheesecake bites with a white wine, pear and grape garnish. Line a 18 x 13-inch baking sheet with parchment paper. For the crust: In a medium bowl, combine all ingredients. Press mixture into baking sheet. Reserve. For the cheesecake: Cream together cream cheese and ricotta until smooth. Add remaining ingredients and mix until well combined. Pour on top of crust and bake for 1 hour. Turn off oven and leave in oven for 1 hour. Do not open oven. Remove and allow to cool in refrigerator. For the pear and grape garnish: In a large sauté pan, melt butter. Add pears and grapes and sauté for 3 minutes. Add remaining ingredients and cook until desired syrupy consistency is reached. Allow to cool to room temperature. Reserve. Cut cheesecake into 30 pieces and plate. Top with garnish.